As a lover of the instrument, you have to make sure you know all that you can. Otherwise, you may never reach your full potential as an artist. Lucky for you, we’re experts on this topic and have combined some of the best fun facts out there. Read on for 11 facts every ukulele player should know. Before learning fun facts, you should know the history of the ukulele. While you may have always known it, it wasn’t too long ago that very few people did. The ukulele became popular in the 1880s in Hawaii. The instrument is a twist on a popular Portuguese instrument also like a guitar. After becoming popular in Hawaii, the instrument moved into the United States’ mainland. During the early 20th century, the ukulele soon became a well-known instrument. Other countries have also adopted the instrument. But it has stayed most popular in the United States. A few popular songs, like “Over the Rainbow,” have helped keep the instruments in style. About five years ago, the instrument saw a resurgence of interest. Ukuleles now dominate the how to section on YouTube, and many groups are meeting up for jam sessions now. Knowing this, you need to be able to set yourself apart as a ukulele player. One way you can do this is to know more about the instrument than anyone else. Read on for more. Most ukulele manufactures today create their instruments with wood or even plastic. The strings tend to be nylon. This makes for smooth and clean playing. In the early days of ukuleles, Hawaiians created their strings with cat or sheep gut. Lucky for us, they aren’t made that way anymore, but you can still find them in some places. The first ukuleles were not for anyone. In fact, they were a sign of a Hawaiian royal. One of the most popular ukulele songs is Aloha Oe. Queen Lili’uokalani wrote the song before Americans took over her kingdom. Ukulele players were also often at royal events. This royal incorporation made the instrument more popular in Hawaii. Had it not been for the royals, the instrument may have never left the island. You may have heard that the word ukulele translates to “jumping flea” in Hawaiian. The story goes that Portuguese visitors to Hawaii played the instrument in a fast manner. And to Hawaiians, it seemed their fingers were like jumping fleas. This is a good theory, but we can’t be sure that it’s correct. Others say that Queen Lili’uokalani, the last Hawaiian monarch, said that the instrument meant something else. “A gift that came to us from far away” is how she defined it. No matter what your definition is, you should know that others may say something else. Either way, the instrument still makes beautiful sounds, no matter what you call it. While the ukulele is a beautiful instrument, its predecessor had a less than a flattering name. The Portugese Machette, as people called it, had four strings. This instrument is what the Hawaiians created their ukulele. And it’s fortunate that they took time to change the violent name. People call the machete’s modern-day version a cavaquinho, and it looks like a ukulele. The main difference is that players tune this instrument in a different way. Other than that difference, the cavaquinho is almost the same. The cavaquinho is more popular in Latin America and Brazil than the ukulele is. Most people think of the ukulele as an American instrument. But the ukulele has found its way into Japanese culture as well. Japanese culture often expects someone to have some kind of hobby. And because the uke is easy to pick up, it is a common hobby for people to have. Also, because of American influence during World War II, many Japanese people saw the instrument for the first time. After the war, the instrument became even more popular. During a difficult financial time, ukuleles were easy to produce. And they were cheap to buy as well. Soon, the ukulele found its place into Japanese culture. Most people would guess that the 1990 hit “Over the Rainbow” is the most popular ukulele song of all time. It did reach number one in 2010 on the Billboard charts. The song spent 76 weeks on the Hot 100 chart. This was a record itself, but other songs have broken it since. The song also had a Grammy nomination in 2009. But it lost to “Viva La Vida” by Coldplay. The song made Mraz millions of dollars, and he saw instant career success as well. That’s not too shabby for a four-stringed instrument. The image you have when you think of a ukulele is more than likely the standard type of ukulele. But did you know that there are plenty more than that? You can buy tenor, baritone, soprano, and even banjo style ukuleles. While these are less common, professional ukulele players may use all of them. Beginners might want to stick with the standard before moving on to more advanced styles. But with practice, they could start to pick up the others. It might surprise you to know that the man who landed on the moon also played the ukulele. That’s right. Even Neil Armstrong couldn’t keep his hands off the four-stringed instrument. After Armstrong and others returned from the moon, they were stuck in quarantine for 21 days. NASA scientists feared the astronauts may have brought back a disease from space. During this time, Armstrong had his ukulele, and he played it often. There are some iconic photos of him strumming in the quarantine room. The ukulele had been stuck in Hawaii for the beginning of its creation. But in 1893, the instrument made its mainland debut. The Chicago World Fair hosted 46 countries in 1893 from May until August. The committee chose the city to celebrate the 400th anniversary of Columbus’ arrival. At the fair, a group of ukulele players entertained the members there. This was the first opportunity for the ukulele to show its stuff. However, the ukulele didn’t become popular at that time. It wasn’t until the early 20th century that the instrument became famous in the U.S. The ukulele is an instrument that many see as a miniature guitar. But this is an unfair assessment. While there is a multitude of differences, one stands out. The instrument does have fewer strings, but the tuning is also different than other stringed instruments. Most guitar players tune their instrument from the highest sound to the lowest sound. This gives a player a constant and predictable sound. Ukulele players, on the other hand, tend to tune their instrument in a less constant way. This is part of what makes the ukulele sound different than most instruments. Some ukulele players may opt to tune their instrument like a guitar. But this is not a common choice. To get a full sound, you should tune your ukulele in the standard way. The ukulele doesn’t stop with Hawaii, Japan, and online tutorials. Even one of the greatest musicians of all time was a fan of the instrument. George Harrison was the guitarist for the Beatles until the band broke up in 1970. Before his death in 2001, he made sure to become a master at the ukulele as well. Harrison often sent his friends ukuleles as gifts as well. And he became a collector before he died. And he helped support its resurgence in the 1990s. He did this by dispelling rumors that the instrument wasn’t as serious as a guitar. Looking for More Ukulele Facts and Information? 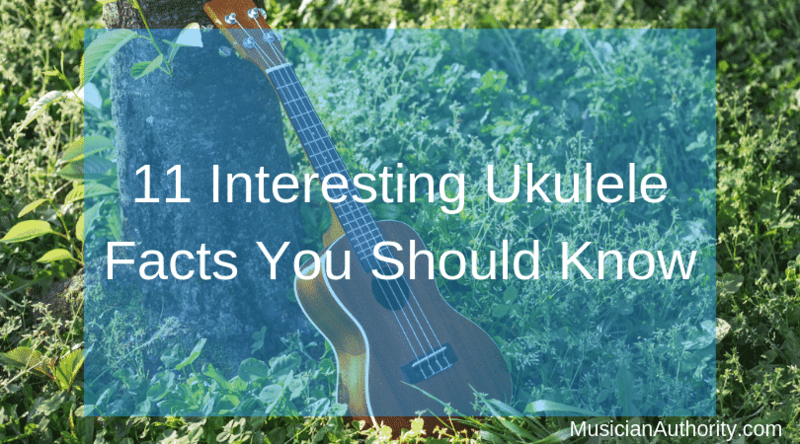 Now that you know some more ukulele facts, you should be ready to impress your friends. In fact, people may begin to think you’re a bit of an expert on the instrument. Looking for more information about the ukulele? No worries. Check out our ukulele how-to section for more posts. And if you’re looking to learn to play the uke, learn a few easy songs on our site. Do you have any questions? Feel free to contact us for more information.